Summer wouldn’t be the same without the smell of barbeque wafting through the neighborhood. Before you light that grill for the next party, remember that a fun-time grilling should also be safe-time grilling. There’s no such thing as a “safe fire.” Common sense and these tips will make for a safe, hassle-free but most importantly enjoyable grilling experience for you and your family and friends. • Make sure you are not wearing any loose clothing. It could hang down and catch fire. • Have a fire extinguisher nearby. • Get long-handled utensils to keep your hands away from splatter and flare-ups. • Situate the grill at least 10 feet away from buildings. This prevents fires, and carbon monoxide from entering your home. Heat can reach further than you think, resulting in melted siding, or worse. • After your gas grill has been sitting all winter, be sure to inspect the hose for cracks or holes. * You can coat the hose in soapy water to check for leaks, a leak will form a bubble. * If in doubt, throw it out. • Never use a gas or charcoal grill indoors. • Set the grill on stable ground to avoid tipping over. • Ignite the grill with the top open. 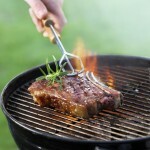 • If a gas grill does not light right away, give the gas time to dissipate before trying again. • Never leave a hot grill unattended. • Keep the flames under control – by turning down the temperature (gas), or redistributing the charcoal. Wire Brushes – Bristles can come loose and stick to the grill, where they are ingested with the next burger. The ingested bristle can become lodged in the digestive tract, resulting in severe pain, and a trip to the hospital. • An onion – Cut an onion in half, and rub the cut side on the hot grill grates. The enzymes in the onion work to break down tough grilled-on food. • Grillstone Cleaning Block – Made from recycled glass, and works like a pumice stone to get rid of the toughest burned-on messes. To help prevent automated spam emails coming to our offices, please type the following characters in the space below. The Weather Can Hurt and Kill! This Blog is a service of Hamburg, Rubin, Mullin, Maxwell & Lupin, a full service law firm dedicated to keeping your family and your business interests safe , injury-free and protected. View our website.